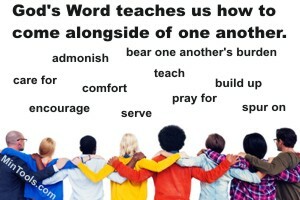 Part of church life is being a community where benevolence – caring – is common place. God tells us to do good to all people especially the family of believers. Sometimes we do nothing about homelessness because we don’t know what real impact we as individuals, or even as a local church, can make. God never intended for one person to do it all. When everybody does their part, we can make a greater difference. To know your part, start by identifying the spiritual gifts God has given you. Then look for ways to serve that fit your gifting. Administration: This person could organize the details, scheduling and staffing of local outreach efforts or organize trips groups within the church will take elsewhere to distribute blankets, food, or personal items or perhaps to help rebuild homes destroyed by natural disasters. Discernment: This person could help the church beware of pitfalls in such a ministry. For example, this person would see that handing money to a homeless person could very well go toward drugs or alcohol rather than food or clothing. This person would tend to differentiate between those who are first time in their homelessness due to a recent crisis and those who are more repeat or long-term due to choices, addictions, etc. Unless accompanied by other gifting, this person might not know the best way to solve these problems but should be consulted about potential issues that could be faced. Exhortation: This person could come alongside of people who are homeless to help empower them by counseling or discipling them in financial management and life skills, GED preparation, employment assistance, etc. Evangelism: This person could be in the forefront of efforts to take the gospel to homeless people where they are — street meetings, distributing tracts and Bibles, not just food and other items. Faith: This person could hold up hope that where there is God, change is possible. This person could persevere in prayer for healing and breakthroughs in individuals’ lives. Giving: This person might set aside a portion of his/her own non-essential spending to donate food, clothes, personal items, or blankets to be distributed to those who don’t have these basics. Or, perhaps financial giving would go to a rescue mission or other organization reaching out to homeless people. This person might also encourage the church to examine their ministry budget for where funds could be reallocated. Helps: This person could come alongside administrators or leaders to make phone calls, type up schedules or promotional pieces, order materials needed, or anything else that would free up the leaders to keep planning and dealing with the bigger picture. Hospitality: This person might open their home to those on the verge of homelessness until they are able to get back on their feet … thus preventing homelessness. Knowledge: This person could pull together Scripture on homelessness and poverty to be used by others to promote an awareness of our God-given responsibilities. This person could research and develop referral lists of public benefits, legal assistance, and other community programs and ministries. Leadership: This person could help the church look beyond their own backyard to the homeless situation in other communities and around the world by developing goals and ideas to partner with others in working toward bigger picture solutions. Mercy: This person would want to go on outreach efforts to rub shoulders with the homeless, to show the love of Christ to them, by distributing coats, blankets, shoes, food, and personal items they might need. Pastor: This person might become a chaplain to the homeless or at least have regular, on-going contact with the same homeless people so as to disciple or mentor them … perhaps setting up a regular coffee or breakfast (or any meal) meeting at a restaurant or other public setting to invest into their lives. Prophecy: This person might tend to remind us of the reasons for homelessness and the need to address the deeper issues, to look at the big picture. Service: This person could help behind the scenes in any way needed, like stocking food shelves, preparing meals, sorting clothes, etc. This could be through the person’s own church’s outreach efforts or at a rescue mission. Teaching: This person could be the one to bring an educational awareness of homelessness to the church, helping people understand the causes of homelessness and solutions for it, particularly in light of principles from God’s Word. Wisdom: This person could be the one to offer practical solutions to the pitfalls the person with the gift of discernment sees. For example, this person might suggest giving gift certificates in lieu of money, taking the person to a restaurant or store and paying the bill, wearing a coat you would be willing to give away, carrying some food items with you to give away, etc. When everybody does their part, we can take a more comprehensive approach to homeless ministry while addressing specific, immediate needs. As noted in the post, Can anybody be a lay counselor?, we’re all called to come alongside of one another. God’s Word provides truths for us to remember that will guide us in the process. In addition to all the one another commands in the New Testament, we can also find many other applicable truths to apply when coming alongside of one another like the following. We are called to come along side of one another to help each other succeed in their ways, even more specifically to walk according to God’s ways. Let’s remember, however, that the ultimate counselor in a person’s life is the Spirit of God (Jn. 14:16, 26). While God will use us in one another’s lives, we should never presume to be the “fixer”, taking on a role not intended for us. If we’re truly going to make a difference in people’s lives, we need to steer them toward God and His ways. Let’s remember the ultimate Source of wisdom, God Himself. While other sources, like the field of psychology, might offer some help, we need to run it all through the grid of Scripture. In coming alongside of one another, we must guard against using a one size fits all approach. What helped one person may not be the solution for the next. People encountering the same issue might need a different approach due to background, personality, level of spiritual growth, etc. We might even need to approach the same person one way one time and another the next. Let’s remember to meet people where they are. Coming alongside of others can be discouraging if you lack realistic expectations. No one is perfect or will ever fully arrive. We are all a work in progress. We serve others with humility when we remember that about ourselves. We extend grace when we remember this truth about others. Click on links below to learn more about the various ways to help people using the different spiritual gifts. As people with these spiritual gifts come along side of others to help in practical ways, showing the compassion and love of Christ to those in need, they must realize that sometimes in addition to “deeds” of kindness, what people need is for someone to simply “be” there with them. People helpers would therefore do well to sharpen their listening skills regardless of what role they take in helping others. Some people may not have the primary people helping spiritual gifts but may nonetheless have a passion toward these areas or toward people in need. They could fulfill leadership or administrative roles within these ministries. They could be teaching and training others to do the work. They could be praying for the ministry. These believers may not be in regular contact with the people in need but still hold integral roles in this kind of ministry. The People Helping Ministry Manual includes the above content plus a simple spiritual gifts test that assesses only the gifts primarily used in a people helping ministry … the five spiritual gifts mentioned above. You’ll also find definitions for each of these gifts with possible uses in this kind of ministry. Too Proud or Afraid to Ask for Help? Sometimes an atmosphere develops within a church where you need to look like you have it all together to appear spiritual. People can sometimes feel like others will judge them as having sin in their lives if they don’t appear “blessed.” The truth is, however, that loss, disaster, and hardship can hit anyone … those walking close to the Lord and those out of fellowship with Him (Matt. 5:45). We need to build environments within our churches where people feel safe to be honest. Part of that is understanding God’s design for the church as one of interdependence as seen in all those one another passages of Scripture. We need to make our life together more about the Lord than ourselves. When the focus is on Him, we become humbled rather than proud. Remember Isaiah’s experience of going into the throne room of God. His response was woe is me (Isa. 6). In a place of humility before God we realize that we are no better than the next person. We all stand in need of grace. Perhaps you are not in a position to do something about the overall state of your church but it has to begin somewhere. Are you a safe person for people to be around? In other words, can people honestly share with you without feeling judged or demeaned? As much as lies within you, are you extending yourself to others in love and compassion? Are you exemplifying a life of both grace and truth? Are you being authentic / honest about your own needs? Are you taking time to get to know people in your sphere of influence? Are you observant of those around you? Are you taking initiative to ask people what is happening in their lives? Sometimes we don’t know because we don’t ask. Some people who appear too proud to say something are just waiting, hoping somebody will notice, hoping somebody will ask, hoping somebody out there cares. If we wait for people in need to come to us, it just may not happen. We need to take initiative and step into their lives as they will allow us to do so. Of course, if people remain closed, we can’t force our help on them. But, we certainly can pray for them. 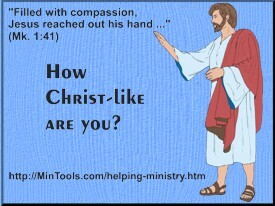 Check out the People Helping Ministry training for different ways you might be able to help others. Learning to do good and share sounds like a kid thing. I remember, when teaching a children’s class, the struggle they often had when there was only a limited number of items of a kind and they had no choice but to share. What about times they had choices? We adults have learned some social graces we might not have had as children but if we are honest, we still struggle to do good and share, particularly in situations where it isn’t required. I don’t know about your church, but my church is far from the example of the early church. Acts 2:42-47 lets us know that they devoted themselves to fellowship … “All the believers were together and had everything in common. They sold property and possessions to give to anyone who had need.” Also see Acts 4:32-35. Do not forget to do good and share with others. 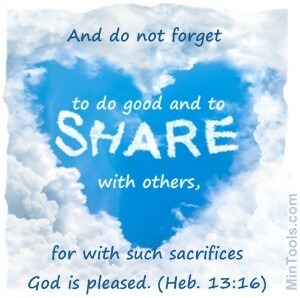 The command in Hebrews 13:16 to not forget to do good and share is applicable to all of us. Such an exhortation suggests we might be prone to neglecting to do good and share with others. Think about how easy it can be to get caught up in the busyness of our own lives that we become oblivious to the needs of others. We might not intend to be so self-absorbed but it happens. Since this is a two-fold command, we would do well to consider the meaning of each command. To do good literally means to do well, to be beneficent. This could take on many forms of kindness toward others. Our goodness emulates the character of a good God (Matt. 5:45-46; 3 Jn. 1:11). And so, in being good to others, we are being His hands and feet in extending His love and compassion toward others. Further, Jesus said “whatever you did for one of the least of these brothers and sisters of mine, you did for me” and “whatever you did not do for one of the least of these, you did not do for me” (Matt. 25:34-46). Jesus takes the way we treat others personally. Being good toward others is a means of serving Him, not just the person in front of us. When we give of our time and resources and are willing get out of our comfort zones or be inconvenienced to help others, we bless God — “for with such sacrifices God is pleased” (Heb. 13:16). Why? His Son sacrificed His life for us. When we turn around and share with others sacrificially, we honor Him. Hebrews 13:16 begins “AND do not forget to do good and share with others” which would connect it to verse 15 — “Through Jesus, therefore, let us continually offer to God a sacrifice of praise – the fruit of lips that openly profess his name.” Doing good and sharing with others is a form of worshiping God. We worship not just with our lips but also by actions that please Him. Further, when others see our good deeds, we are letting our light shine, causing them to also “glorify your Father in heaven” (Matt. 5:16). Compassion: More than an Option? Click image to open in Pinterest & repin. Sometimes it seems easier to close our eyes to all the pain and sorrow around us. Certainly it can be more convenient for us to ignore what we see. And, it is more comfortable to not let ourselves feel for people and respond to their needs. But, is compassion, for the believer, optional? If we want to be Christ-like, then we must answer no, that it is not optional. We must both feel compassion and respond, as we saw in a previous post. If we get beyond the example of Jesus, we will find Scripture, like Colossians 3:12-14, that lets us know that compassion is more than an option. Compassion is an identifying mark of belonging to God, who is “the Father of compassion and God of all comfort” (2 Cor. 1:3). Compassion is not reserved for people with the spiritual gift of mercy. Rather, if you are one of His, you are to be compassionate regardless of gifting, personality, or background. Compassion is something that is outwardly manifested, something we put on that others around us can see and thereby know that we belong to Him. Compassion is the logical reaction to who we are in Him and His love toward us. 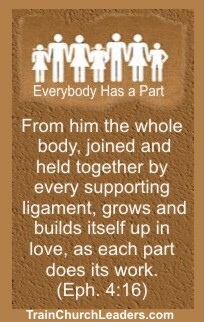 We are set apart to live according to God’s standards and to love as He loves. He is “the Father of compassion and the God of all comfort, who comforts us in all our troubles, so that we can comfort those in any trouble with the comfort we ourselves receive from God” (2 Cor. 1:3-4). Compassion can’t help but grow out of holiness and knowing how much we are loved by God. Compassion is commanded which means it is not an option. We must be intentional about putting on compassion. We don’t wait until we “feel” moved or when it is convenient or comfortable for us. Compassion is an expression of love, the Greatest Commandment. Compassion, along with kindness, humility, gentleness, patience, and forgiveness helps define love as seen in 1 Corinthians 13. If we are going to fulfill the Greatest Commandment, we must be clothed with compassion.